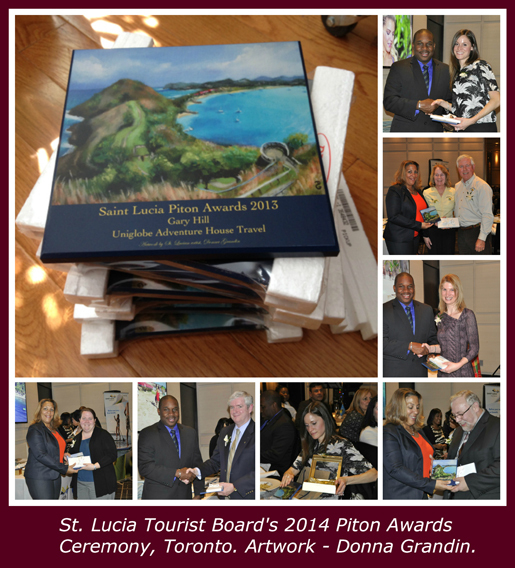 Photographs of ceremony honouring top travel agents in Canada in the PASS programme for 2013 – held March 25, 2014 – courtesy of St. Lucia Tourist Board. The life of an artist has its ups and downs, but one thing is for certain – whenever you show your art, you open up the door to new opportunities, and to unique experiences. I learned pretty early on in my art career that there is a snowball effect that happens when you exhibit, and when you talk about your art. In 1998 I participated in 19 group and solo exhibitions, even though the year before I did not know any of those opportunities existed. As an International student, I knew no-one in the city of Hamilton and spent most of my time in a little bubble on campus, but that had to change once I graduated, because I married my Canadian fiance and needed to start seeing the city as my new home. I began with volunteer work, and ended up on the organizing committee for Public Hanging, a 3 month long exhibition on the empty top floor of a downtown mall. For security purposes we had teams of 2 participating artists located at either end, and I signed up for two 3 hour shifts a week – a great opportunity to meet and network with local artists. Now I look back I guess it was like speed dating! Anyway, each exhibition led to another, and before I knew it I had paintings on the set of the morning talk show of a local television station, a solo exhibition in the atrium cafeteria of a hospital, and I was part of a short-lived artists’ collective exhibiting in a pop-up gallery in an empty storefront (long before that became a thing). Even before that I had a exhibition in a library which led to an interview on a Caribbean radio show and participation in a Caribbean Arts Showcase. Each new person who sees your work has the potential to become a collector or a connector, and there is no time limit as to when that might happen. My best friend from University used to invite her high school friends from Toronto to party with us on the weekends. Fifteen years later she forwarded my exhibition invite to one of those friends who remembered me and my paintings. She came out to the exhibition and went on to become one of the biggest collectors of my work, AND a wonderful friend and supporter. The path ahead is never completely clear, which is both daunting and exciting, but when you look back at the way you’ve come, your footprints form a pattern. So a call out of the blue from the president of the St. Lucia Toronto Association to invite me to participate in the 35th Anniversary Independence Arts Showcase leads to me exhibiting at the Gala event as well, and to an e-mail from Alison at the St. Lucia Tourist Board – which leads to them ordering these plaques as awards. Saint Lucia Tourist Board Director of Tourism Mr. Louis Lewis and Saint Lucia Tourist Board Deputy Director of Tourism Tracey Warner-Arnold presented the award winners with their plaques. Then I did a blog post about the Gala (which was re-posted on the St. Lucia Consulate website), and I forwarded the link to people who signed my guest book at the event, and one of them contacted me to order “The Sunday Hike” – the original painting of Pigeon Island National Park in St. Lucia that was chosen as the image for the plaques. And the tale does not have to end there … now there are 8 plaques, 1 original painting, and this blog post all going forth as ambassadors of my art. How can you add to this story? If any of the travel agents get to read this – Congratulations, and I would love to receive a photo of your plaque on display in your office – maybe I can do a follow-up photo collage!